Austria has something of a reputation for having low-altitude resorts which suffer from problems in bad snow seasons. With the advent of extensive snowmaking facilities in most resorts, this is something of a red herring – and Austria can anyway boast more glacier and high-altitude ski resorts than any other country. Of course, the higher the skiing the more snow is needed to cover the rockier ground underneath – if you are skiing on top of pasture you only need 20-30cm of snow cover, while rocks at high altitude can still poke through more than a metre of snow. Skiing on a glacier just about guarantees snow whatever the winter is like – but there are certain aspects to bear in mind. For a start, glaciers, by their nature, tend to be high in the mountains, which can mean a more problematic drive or a longer transfer from the airport. As they are more remote, they are less likely to have a nearby typically Austrian village and skiing in the morning often involves a long lift ride up to the slopes. Lastly, if the snow is bad in a particular year, a lot of other people are going to want to ski on a glacier…. The glacier ski area near Neustift in the Stubai valley offers the advantage of being relatively close to Innsbruck airport with motorway connections up to the Stubai valley, although the glacier is a surprisingly long drive from the valley entrance. The ski area is extensive for a glacier and it is a popular day trip from Innsbruck and other centres in the Inn valley. Accommodation is best in nearby Neustift or some of the other small villages along the valley floor. This area is open all year round and is located high up in the mountains at the end of the Ziller valley (head to Mayrhofen, catch a right and then keep going as far as you can). One of the ski passes on offer also includes the option of skiing in the other resorts in the valley. For such an out-of-the-way area, the skiing can be stunningly good (and quite challenging). Accommodation is available in Tux itself at the base of the glacier lifts or, as most prefer, in the larger and more sporty resort of Mayrhofen. Sölden can boast not just one but two operating glaciers, connected by both ski lifts and a road tunnel. These days the glacier areas are also connected into the main winter ski area above the village – so it is possible to ski from the glacier all the way down to the level of the accommodation. Understandably the skiing is probably more interesting on the winter ski area than on the glaciers themselves, but the general altitude is high enough for snow cover not to be a problem in most years. The Kitzsteinhorn glacier is situated above the town of Kaprun in the province of Salzburg. Like most of the other glacier resorts mentioned on this page, the Kitzsteinhorn opens early and closes normally well into the spring or even early summer. 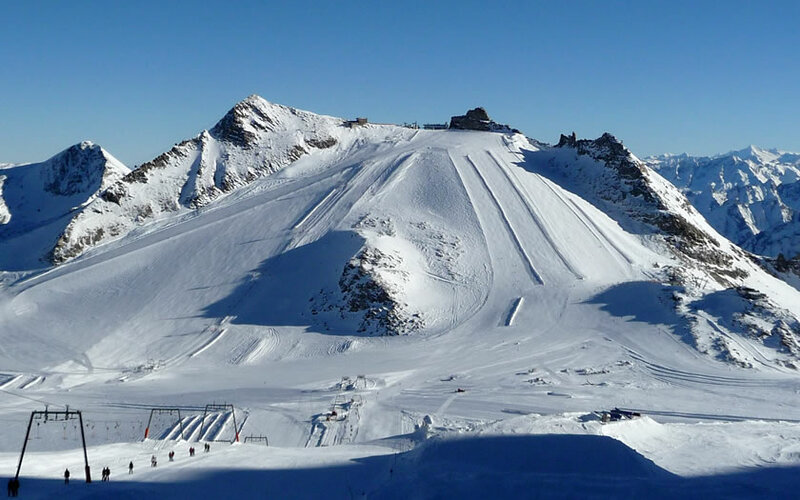 Like the Hintertux glacier above, the ski area on the Kitzsteinhorn doesn’t only include gentle blue runs – it can provide a fair challenge for competent skiers as well. The slopes on the Pitztal glacier are a typical mix of red and blue runs with the possibility of skiing all the way down to the valley floor in good conditions. This classic glacier ski area is situated at the end of a long valley running to the south of the main Inn valley in the Tyrol and offers some stunning panoramas of the nearby mountain ranges. Most accommodation in the valley is split up between a number of villages, but the Mandarfen area would be most convenient for the glacier ski area and the nearby small Rifflsee ski area. Other glacier ski areas not yet covered on this site include the Kaunertal glacier in the Tyrol, the Mölltal glacier in Carinthia and the Dachstein glacier in Styria.